Special ceiling treatments and open spaces make this modest home live bigger than its square footage would indicate. Columns refine entry to the formal dining room with elegant tray ceiling, while the great room gains volume from a cathedral ceiling and opens to the kitchen and breakfast area. The kitchen's highlights include an over the sink box bay window, cooktop island, and pantry. 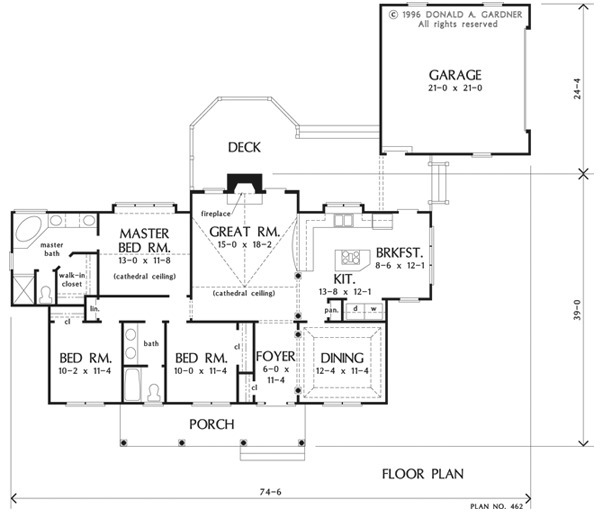 The master suite features a cathedral ceiling, box bay window, and private bath with walk-in closet. Two secondary bedrooms share a hall bath. 1st Floor: 1574 Sq. 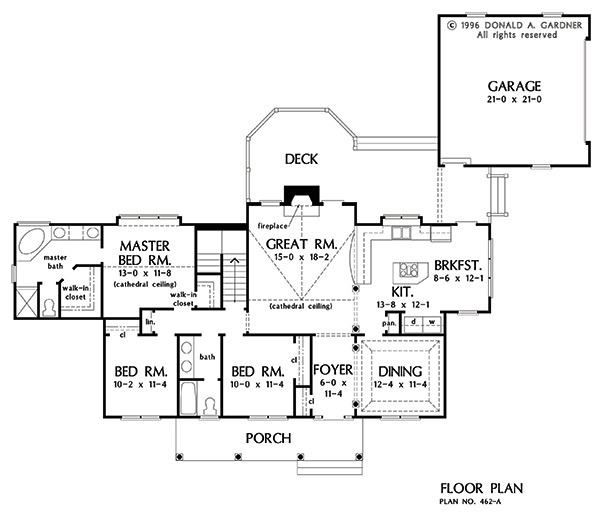 Ft.
House Dimensions: 74' 6" x 39' 0"
Great Room: 15' 0" x 18' 2"
Master Bedroom: 13' 0" x 11' 8"
Porch - Front : 26' 6" x 6' 0" x 0' 0"
Deck / Patio : 27' 2" x 13' 2" x 0' 0"
Other : 7' 6" x 8' 0" x 0' 0"
Foyer : 6' 0" x 11' 4" x 8' 0"
Dining Room (Tray): 12' 4" x 11' 4" x 9' 6"
Great Room (Cathedral): 15' 0" x 18' 2" x 16' 0"
Kitchen : 13' 8" x 12' 1" x 8' 0"
Breakfast Room : 8' 6" x 12' 1" x 8' 0"
Utility Room : 6' 0" x 2' 11" x 8' 0"
Master Bedroom (Cathedral): 13' 0" x 11' 8" x 13' 0"
Bedroom #2 : 10' 0" x 11' 4" x 8' 0"
Bedroom #3 : 10' 2" x 11' 4" x 8' 0"